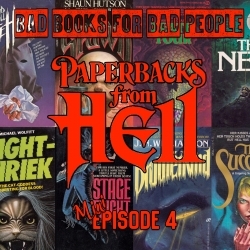 Paperbacks from Hell by Grady Hendrix strikes the perfect balance of context, curiosity, and lurid sensationalism in its approach to the paperback horror boom of the 70s and 80s. Daring to peer beneath the gruesome (and often just plain baffling) covers, Hendrix and his colleague and researcher Will Errickson chart the trends, history, and notable figures involved in creating these once ubiquitous tomes. This book will slake your thirst for killer crabs, Nazi leprechauns, and suburban devil cults. On this mini episode, Kate and Jack talk to Will Errickson of Too Much Horror Fiction about his horror paperback collection, some of the factors that came into play during this particular period in pulp fiction, and the role of these books in today's popular culture. Catch Will and Grady on the Paperbacks from Hell book tour at Powells Books in Beaverton, OR this Thursday October 12.